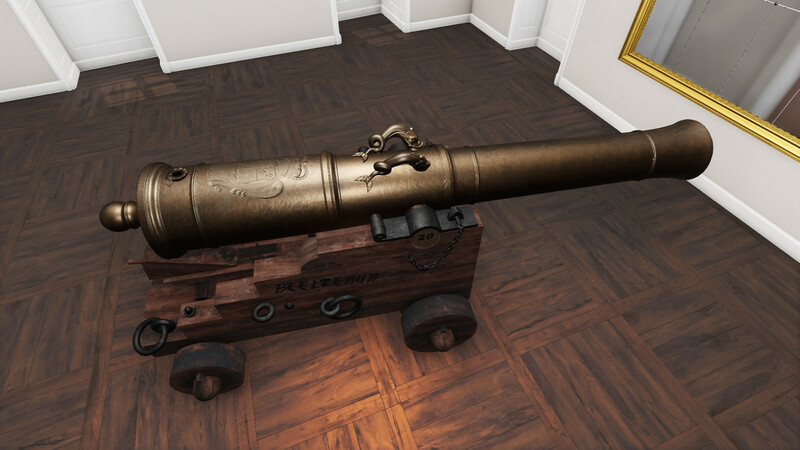 for my cannons I ask for serious help because I dont know how to make it work in CryEngine. I work since 2007 in this theme as hobby with a lot of CryEngine versions. But many setbacks pave my way, teammembers left and I waited for the right version of CryEngine to restart the whole theme again. For the first part of my seafaring theme I want to setup a cannon. These can be placed at the top of a fortress or at vessels decks. Please think about Black Sails or Pirates Of The Caribbean. In Unity our team made a script that the dependency of the Quoin to the Barrel will setup its elevation right. In CryEngine we cant access any submodell of a cgf or cga directly so I think about to rig the gun or animate with keyframes the geometry. Both is no problem but I need to know first how to setup the gun in the engine to work right before I think how to setup its geometry in Maya. For the shot I want to setup the cannonball that it stays in place after firing. I mean the lace where it landed (like the fun-lego-gun someone made a few years ago). I want to setup manually how long the fired cannonball will stay in place. Any help is welcome and I am very thankful for it!! Unfortunately I am not a programmer but I will do what I can do when someone assist me a little bit (I have some scripting knowledge). Thank you so much for your help and support!! i have something similar prototyped its like a rotating mortar launcher that tilts for distance change. Place a BasicEntity, right click create flowgraph, import graph. Hi, thank you very much for your reply and sorry for my late reply. I got an error within my information system. Vance Mcfadyen, the retired systems engineer and CryEngine supporter, joined our seafaring project and give a great helping hand in this case. Thankfully a few Crytek-Employees assist him to setup the first version of a usable gun-system we can use remotely (for example on vessels decks - using flowgraph) and join (fire) manually. He find out, that the base tank system was the best solution for us and setup the gun this way. He got the great info from his Crytek-contacts, that it will be the best solution when we add the "turret-node" to the tank. He got help in compiling the need dll fot that and now we can try out what we can do more. Unfortunately I cant code but I look into the first tutorials to do small actions by myself. Plus I need to catch up a lot of information in using CryEngine because many things changed in the last 11 years. Currently we try to get our old team together plus new joined members from the huge Pirates Ahoy Community. Its time that we bring back to life what we started in 2007 and tried a 2nd time in 2010, in CryEngine. Today with are starting the 3rd attempt with having Source Code and much more options then 11 and 8 years ago. Hold fingers for that. i have never thought about using the base elements of the tank that is something i will look into.